Free school supplies can help ease the burden of back to school costs that many families face. With the cost of school supplies rising and the number of supplies being demanded from schools going up, it's costing more and more to buy school supplies each year. If you have a few school-aged kids then your costs can easily reach hundreds of dollars each year. Whether you're a parent who can't find money in your budget to buy school supplies this year, or you're trying to stretch your budget, look below to find some ways you can get free school supplies for your children this year. Your first step to getting free school supplies should be by contacting your child's school. Often schools will purchase extra supplies each year that they can provide for families who are unable to buy them. Sometimes the teachers themselves will use part of their classroom budget to buy extra supplies for their students. If you don't have any luck with your child's individual school, you'll want to contact your school district. Many school districts have programs set up where the community can donate school supplies that they can then give out to families who need them. If they don't have a program set up, they will likely have information on city-wide programs that give out free school supplies. Reaching out to the community should be your next step in getting free school supplies. All kinds of organizations set up programs to give out school supplies, you'll just need to find out who they are in your community. You can contact your local news stations and newspapers. This is who organizations who give out school supplies contact when they want to get the word out about their program. If your local media isn't aware of any programs, they will most likely be able to do the footwork to find out where those programs are. 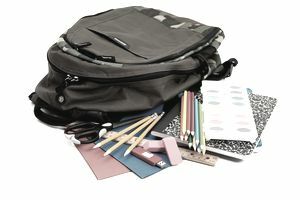 Other places that frequently set up free school supply programs include local universities, churches, and charities such as Volunteers of America and United Way. If you are a military family, Operation Homefront partners up with Dollar Tree every year to give out free backpacks and school supplies. You can register for the upcoming Back-to-School Brigades so you can take advantage of this fantastic program. If you're looking to stretch your back to school budget, watching for free after rebate deals will help you score quite a few free school supplies. Many stores offer free after rebate deals on school supplies and you'll need to watch your Sunday circulars to see if there are any deals for the week. Staples stores have a program called Staples Easy Rebates that makes it really easy to get free school supplies during July and August. Free after rebate items can make stores money because so many people forget to send in the rebate. Make sure that you submit your rebate so you get your money back or your school supplies won't be free after all. Don't hesitate to take advantage of free after rebate school supplies that's not on your child's school supply list this year. Put it away for next year or better yet, donate it. Back to school shopping is big business for stores and they're looking to get you in and spending money. They'll often have doorbusters to get you in the door. They're hoping you buy all your school supplies there but that doesn't mean you have to. OfficeMax/Office Depot and Staples frequently have school supplies on sale for 1¢, 10¢, 50¢, and $1. Sometimes they also have coupons in their ads to help you save even more money. If you're like most parents, you have a drawer or even a closet full of school supplies that you've bought int he past and probably not going to need again. Consider hosting a school supply swap where parents in your school district or neighborhood bring the school supplies they don't need and trade them for ones they do. If you can't get free school supplies you certainly can get them cheap. To do that you'll need to shop at more than one place, watch the ads, and use coupons. If you go to one place and get all the school supplies you need you'll be paying a lot more money than you have to. You'll want to start watching the newspaper ads in July and start visiting each store to pick up only the really good deals. Pay special attention to the Walmart, Kmart, Big Lots, Target, Walgreens, and grocery store ads for back to school sales. These stores will have a few items that are a particularly good deal each week. If you don't get a newspaper you can view and subscribe to all of these ads online. Coupons are a great help in saving on school supplies as well. Watch your Sunday newspaper coupons and visit Coupons.com often to see if any coupons pop up for school supplies. Combine these with a sale and you'll really save some cash. Another way to save on school supplies is to take advantage of tax-free weekends that many states have to help ease the cost of school supplies and other back to school items. Now's the time to get next year's free school supplies. Your child will always be required to bring basic supplies like pencils, crayons, and notebooks as some of their school supplies every year. When you see a good deal buy some extras that you can use for next year.